If you have a cute and fluffy female hamster, some knowledge about these animals' heat or estrus cycles can be extremely useful. The age of reproductive maturity tends to arrive quickly in the hammie world -- very often when they're barely 1 month old. For a female hamster who's just becoming physically mature, in an early case you might see a first heat cycle when she's about 35 days old, according to the website of Louisiana State University's School of Veterinary Medicine. Although some female hamsters enter their first heat cycles when they're 5 weeks old, the typical age of maturity is slightly older. According to the website for the Purdue University College of Veterinary Medicine, they usually mature between 6 and 10 weeks in age. 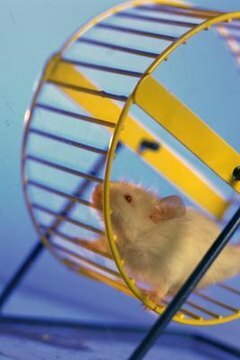 Male hamsters mature more slowly; they generally become reproductively capable between 10 and 14 weeks old. Male hamsters do not have heat cycles. The hammie heat cycle is very fast-moving, especially compared to those of dogs and cats. Once every four days or so, your female hamster will be in "mating season" for several hours at a time. Heat is the only time that female hamsters are responsive to mating. One prominent indication that a hamster is in heat is the marked odor she gives off. It's usually musky and potent. If you suspect your female hamster is in heat but you're not 100 percent sure, be on the lookout for telling signs. Toward the beginning of heat, you might notice a vaginal discharge that is rather clear and sparse. On the third day of the cycle, she might emit a vaginal discharge that is significantly thicker and more material. If your hamster has any close contact with a male hamster, no matter how brief, pregnancy is very likely.